The NCAA Women’s Regional comes to Wells Fargo Arena this Saturday and Monday. The top 3 seeds in the Des Moines Region advanced to The Sweet 16 for the semi-final matchups on Saturday. In one game, top seeded and undefeated Baylor will meet the 4th seeded Georgia Tech Yellow Jackets. Baylor stands 36-0 and looks to become the first team in NCAA history (men or women) to win a title with 40 victories. The Bears feature Junior Brittney Griner, who dunked in Baylor’s 2nd round win over Florida. Griner averages 23.1 PPG. She’s definately worth the price of admission. Ga Tech is 26-8 and making their 1st ever trip to the Sweet 16. The other game pits 2nd seeded Tennessee against surprising Kansas. The Jayhawks are seeded 11th and upset 3rd seeded Delaware in the 2nd round. The LadyVols and Head Coach Pat Summitt are legendary when it comes to women’s basketball. UT has won 8 national championships under Coach Summitt. This is their 30th trip to the NCAA Tourney (All in Sweet 16). The LadyVols are also 26-8. Meanwhile Kansas comes in 21-12 and is led by former Iowa Asst Bonnie Henrickson. Side note: Baylor and Kansas are the only two schools to have both their men’s and women’s teams in the Sweet 16. Northern Iowa is the host school for this event. Athletic Director Troy Dannen tweeted Tuesday that 7,000 tickets have been sold so far. Central Iowa is home to some of the best women’s basketball fans in the country. Iowa State was 3rd in the nation (behind Tennessee and Louisville) in attendance this season, averaging nearly 10,500 per game. So hopefully we see lots of the same this weekend. Des Moines shot the moon last week selling out next year’s NCAA Wrestling Championships, which will be at Wells Fargo Arena. Put out a good showing here, the NCAA may award Des Moines a men’s 1st and 2nd round venue for Iowa’s capitol city very soon. 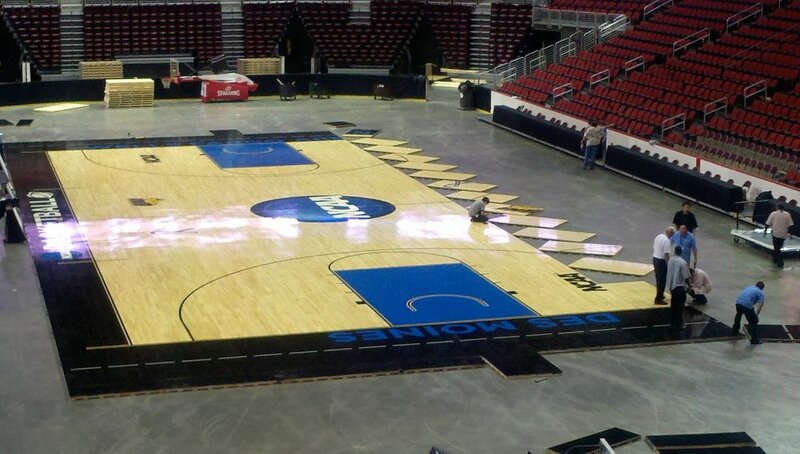 The Wells Fargo Arena staff working early in the week to put down the hardwood for the NCAA Regional (Photo courtesy of the Greater Des Moines Convention and Visitors Bureau). 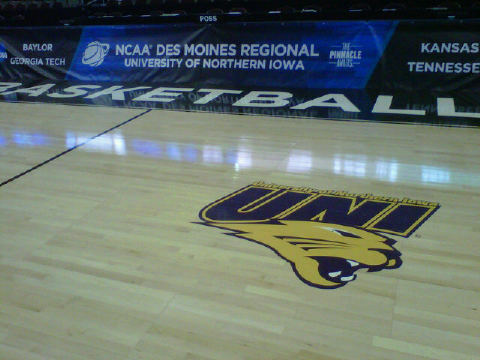 Photo courtesy of Colin McDonough (UNI Sports Information). So Northern Iowa is the host school for this event? That’s all good – I guess I just don’t understand how the NCAA makes these determinations. Hope all goes well this weekend in the DM Regional! UNI volunteered to take that responsibility because Iowa State already was hosting 1st and 2nd rounds; Drake is getting ready for the NCAA Track and Field Championships this summer and Iowa is doing the same with the Olympic Wrestling Trials next month. Northern Iowa was more available to host (heard this on 1700 a few weeks back in an interview with GM Chris Connolly of the Iowa Events Center).